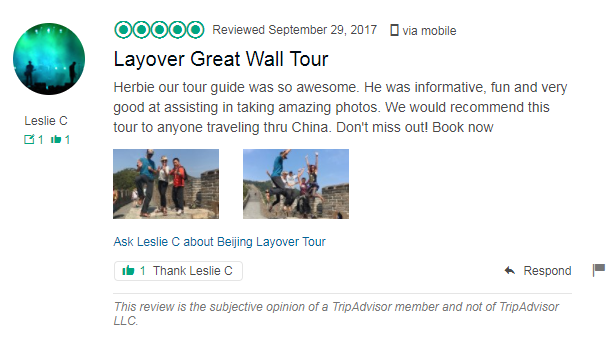 Tour Description: Beijing airport pick-up by our private tour guide upon your arrival, and then drive to the Badaling Great Wall, which is the most famous and best-preserved section of the Great Wall. 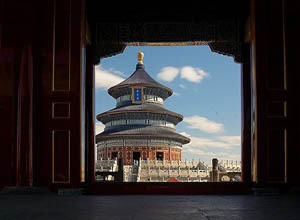 Move on to Temple of Heaven in Beijing downtown city, a majestic imperial architecture where the Qing emperors held sacrificing ceremonies annually to heaven for a good harvest. Back to airport after the tour. End of our service and thank you for using our service! *Cable cars at Great Wall. I have a layover in Beijing between 5pm (February 5th) and 10am (February 6th). I am looking to tour the great wall in the evening and early morning. Would this be possible. I am also open to seeing another attraction before returning to the airport. What tour would be best for me? Sorry, we do not have layover tours suitable for you. Your arrival time is too late and departure time is too early.